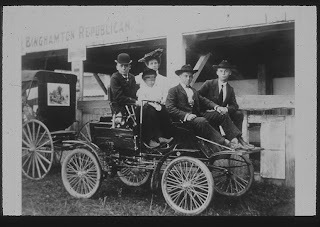 This is the Elliott family of Chenango Forks at the Broome County Fair in the early 1900s. Oldest son Fred was a photographer from his teens on. He chronicled the history of the hamlet in pictures for a number of years. Last night I went to the fair and picked up my Christmas quilt and a red ribbon. I made this quilt last winter and finished it in time to use as a snuggle quilt around the holidays. My summer reading list includes The Mighty Queens of Freeville by Amy Dickinson and Haven by Ruth Gruber. This was an intense book about the refugees Ruth Gruber accompanied back from Italy in 1944 to Oswego, NY. I just finished the latest Dorothea Benton Frank book Return to Sullivan Island. I've been a fan of Ms. Frank for about five years now. Now I need to read the latest Janet Evanovich story of Stephanie Plum who lives in the hood, Grandma Mazur who lives to go to wakes and Lula, a former ho. Today my list is short but time consuming. We plan to watch the NASCAR race at noon from Pocono. The race was rained out yesterday. Stitchinjoy went to the Quilt Odessy at Hersey, PA and told us today about the flooding enroute home. She had beautiful pictures, including one of a long arm quilted wedding gown. Off to fix breakfast before I hear the pathetic voice from downstairs "Is the diner closed?"